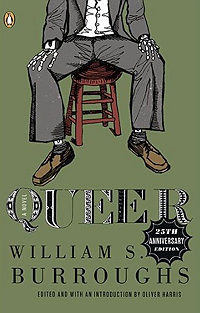 Though the first published edition of Queer was assembled from a mix of manuscript sources, it was done with the collaboration and blessing of the author. In crafting this new edition, which is a sort of remix of manuscript sources, how do you justify to yourself creating a text that would no longer have that authoritative input from the author himself? But in terms of lacking Burroughs’ imprimatur, I would say this: that what has made researching the material history of his works, and then editing those works, so fascinating, is to find myself caught up in the same processes of collaboration and contingency that always shaped his writing. Everywhere you look, you see the hand of others or indeed the hand of chance, making key decisions for Burroughs. Now, although I wouldn’t cast myself as his “collaborator,” editing is a collaborative process, and I know there is a limit in trying to do “what Burroughs would have wanted” — because he himself did not see it that way. What I have tried to do is to make all my editions as transparent as possible when it comes to both the history of the materials I’m working with and my own editing. This new edition of Queer puts the emphasis on the text written in the 1950s and seems to consciously defuse the attention-getting preface that Burroughs wrote in 1985. Can you clarify your reasons for wanting to deflect attention from the preface back onto the 1950s text? I’ve written at some length about this in Secret of Fascination, because there’s no doubt that Burroughs’ 1985 introduction decisively shaped how Queer has been read — or perhaps, misread. I’m not especially interested in speculating about motives, but the effect of the introduction has certainly been to obscure the narrative by explaining it away — displacing a story of homosexual desire by the death of his wife, Joan. That’s why I felt the need to move the introduction and include it as an appendix — very much as Miles and Grauerholz did in their “Restored” edition of Naked Lunch with that book’s equally influential and equally suspect “introduction” by Burroughs. 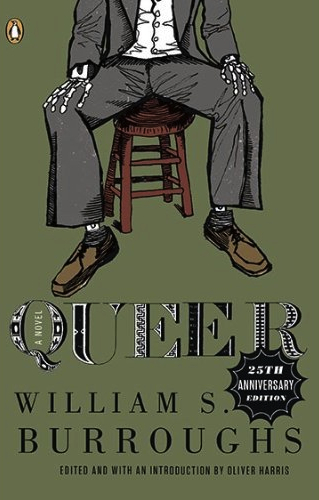 If the only value of my new edition of Queer is to make it easier for readers to really encounter the narrative — to experience it for what it is: “queer,” in every sense of the word — then I’d be satisfied. With the new Queer and with your previous edition of Junky, the texts actually seemed to become more Burroughsian than they had been when published by Burroughs. Do you worry about how your own image of Burroughs might shape the texts? That’s an intriguing idea, that these works have become more rather than less Burroughsian, but I don’t see it that way myself. I guess it’s hard after a while, you become so insanely familiar with all the words that you can lose track of the overall feel, almost forget what it was that drew you in in the first place. In what ways did editing Junky, Yage Letters, and Everything Lost influence your approach to this new edition of Queer? It wasn’t really a question of “influence,” although certainly the earlier editing gave me confidence in my working methods and taught me some lessons. After all, with editing as with most things in life, you learn by doing. However, what really counted was my familiarity with the manuscripts and their incestuously tangled histories. In that sense, Queer really didn’t stand alone, and how I approached it was certainly shaped by what I had already done with the other manuscripts. I suppose if I were to start over again, it would have made more sense to edit Junky, Queer, and Yage Letters all together, so that no decisions were made on each individual text without considering the others, rather than one at a time — but that’s not how publishing or editing work out. You took a trip to Mexico a few years ago. Was this helpful while working on this new edition of Queer? In terms of my research for Queer, going to Mexico was crucial. With a certain self-reflexive irony, I was following in Burroughs’ footsteps by seeing myself as an old-style gumshoe, piecing together clues and trying to figure out who did what and when. So in September 2006 I began what you might call location scouting, looking to identify the locales in Burroughs’ work. I started with the very first scene in the novel, which is set in the “Amsterdam Avenue Park.” I’d long been fascinated by the description of this park in Queer, especially those “concrete benches molded to resemble wood” that Lee sits on. One morning I literally walked right into the park, which is in the Colonia Roma district, and found myself looking at one of these crazy benches. Later, I came across a faded photograph of Burroughs from that era, dressed in a battered suit and fedora and looking just like an old-time detective, and he is standing in that very spot, with some of those implausible pieces of park furniture in the background. One mystery solved. Of course, putting yourself in the place of the author doesn’t offer any practical help whatsoever in editing a text — but it creates an emotional connection, a point of intuitive identification, and that can keep you going when the odds seem against you. And more generally, my couple of weeks in Mexico City were just so weirdly Burroughsian — to list the series of coincidences I had there would make you laugh; there’s no way you’d believe the half of them — and again, that is a sort of psychic supplement, a back-brain stimulus, that works away on a deeper level than deciding whether to change a comma into a period. David Cronenberg had to confront a lot of questions about his own sexual identity when creating his film of Naked Lunch. Did you think that editing Queer would put you into a similar position? Funnily enough, this was a question I raised right at the start directly with James Graeurholz — who, unlike me, is very knowledgeable about these areas of sexual identity and history. But he said (I paraphrase): being a straight man hasn’t stopped you doing a good job before, why should it now? If Ace had accepted Queer for publication as a sequel to Junky, how do you think that might have changed Burroughs’ writing in general? Would it have set him on a different path? The trouble with the “what if” question is that once you ask one you have to ask others: what if New Directions had not rejected Junk, and so left it to Ace Books? Would it have appeared a much more literary text? And would the text of Junk have been published as Burroughs originally intended, before Ace steered him into cannibalizing Queer to make Junkie longer? In fact, the most intriguing plan back in 1952 was for Ace to publish Junk and Queer together in one book. Can you imagine the effect of that? If everything else in Burroughs’ literary history stayed the same, the impact of that double book as the precursor to Naked Lunch would have been utterly different to Junkie published alone. As for whether Burroughs’ path might have been different, I don’t know. From one point of view, Burroughs was a driven man during the 1950s, fulfilling his destiny as a writer even if he didn’t always know it. From another, he diced with a dozen different fates and could as easily have faded out into an old bore under a potted palm in the Parade Bar in Tangier along with English colonels in crumpled sepia linen suits and a warm martini. Around the same time as Burroughs was writing Queer, Allen Ginsberg was writing of obsessive love in “Green Automobile” and Jack Kerouac was writing about it too in The Subterraneans. Was obsession “in the air,” or did the works encourage each other somehow? It’s especially pointed in the case of Kerouac, given that Alene Lee was the subject of Subterraneans and later helped to type up Queer. It’s an incredible coincidence that you were in Lawrence, visiting Burroughs for the first time, on the very day that the first publication of the Queer was announced by the New York Times. Have you wondered what he would have thought of you re-editing it all these years later? Oh, I don’t think he would have been that bothered. That’s not to say he didn’t care about his work — on the contrary, it’s hard to imagine a writer who took his work more seriously — but I think at a certain point he surrendered possession of it and let others finish it off. But as for the coincidence of being out in Lawrence that day, of course I didn’t know that at the time, but in retrospect it seems so right somehow. Published by RealityStudio on 10 October 2010. See also the text of Professor Harris’ talk Confusion’s Masterpiece: Re-Editing William S. Burroughs’ First Trilogy. Have you ever examined the Burroughs collection at the New York Public Library.